Welcome to another Fast Friday! It's almost the weekend and here's a quick bit of beauty. These four colors are perfect for the upcoming springs and you can use all of these shades as a quick sweep across the lid when you're in a hurry or to create a whole look. I've had some a long time and some I have picked up in the last two months. Urban Decay Laced is a perfect no makeup shade or as a blending shade. It's dark enough that it leaves a shadow, but it is soft enough to transition with. It's ultra buttery and smooth! Originally from the 1st Vice Palette and now sold as a single. Urban Decay Omen is one of my all time favorite purples. It has this amazing duo color effect that catches the light amazingly and adds tons of dimension to the eyes. I had to get it once I swatched it. I've had it for a while and love it in the spring/summer. It's very smooth and there is no fall out. Urban Decay Blunt is a gorgeous golden champagne shade. It is so smooth and glides on the lid perfectly. This is a great shade for when you just don't have time for a whole look and you need to put some life into your face. This will do the trick. I also like it for an inner corner highlight. 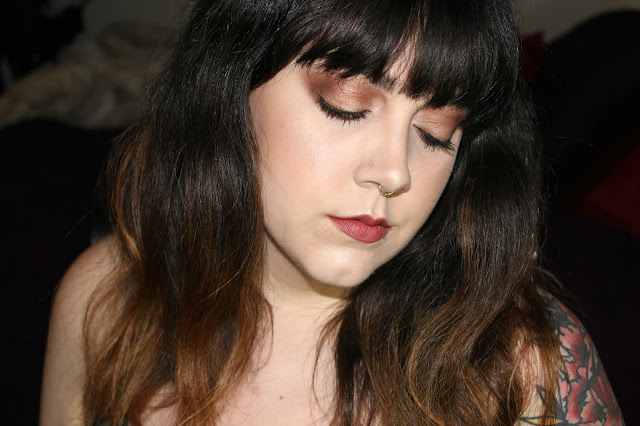 MAC Satin Taupe, a cult classic that I'm sure you've heard heaps about already, but here's my thoughts. It is a shade that can be quickly put all over the lid and it looks like a soft smokey eye look. It's perfect paired with a red lip and you look great for a night out. So tell me, what's your go to shadow when you just don't have time?